Your Body’s Love Language – Could It Be Speaking To You About Your Jaw? Body language is a method many of you may employ during Valentine’s Day this month. Some common body language movements that signal your love for someone may include a shy look, blushing cheeks or even a fluctuation of your voice. Some of these body language signals are voluntary and some just happen whether you like it or not. Your body not only can speak to others, but it’s also in constant communication with you. Your body’s nervous system controls how you process and sense pain. If you have a disease or injury your tissues in that area release chemicals that communicate with your nerves. Your nerves carry the information from the affected area to the spinal cord and up to the brain. Listen to your body’s messages by watching for signs and symptoms that may be telling you there is a problem. One message your body may be trying to communicate with you has to do with your jaw. In the morning, do I struggle with opening my mouth? Do I have jaw and cheekbone pain? Do I hear ringing in my ears or have ear pain? Can I hear clicking, popping or grating when I open my mouth? Your body may be speaking to you and signaling that you have TMJ Disorder. 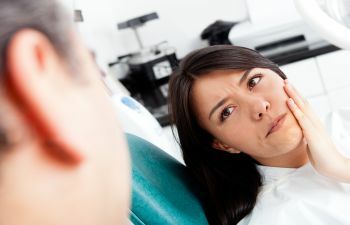 Contact Feather Touch Dental Care today for a thorough analysis to determine if your pain is related to TMJ Disorder.